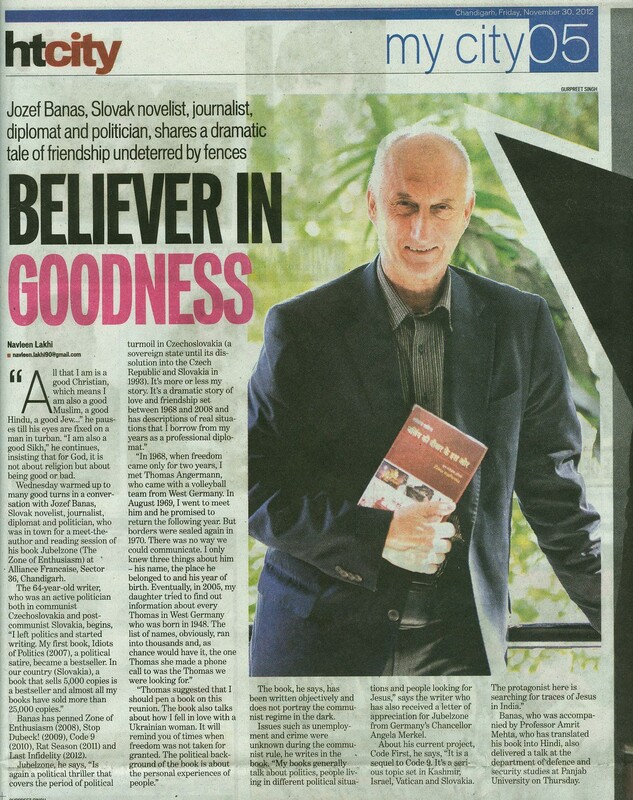 Daily Bhaskar: I am looking for Jesus’ History in India: India will be present in Slovak writer’s Josef Banas book: On Wednesday evening Josef Banas reached Alliance Francaise, the French Cultural Centre at Chandigarh in Sector 36. He read extrats from his Slovak novel “Zona Nadsenia”, and then extracts from the German and Hindi translations were also read. Banas is presently working on his 10th book entitled “Code 1”, in which he is looking for the history of Jesus’ stay in India. According to him, he has already travelled to Kashmir and South India in his quest. “My endeavour is to help Christians and Jews bind with each other. This is my fourth book, which is a sequel of ‘Code 9’,” says the author. Before his lecture Jozef spoke on the journey of his life. Born in 1948, he lives in Bratislava, the capital of Slovakia. From being a journalist he came into the field of foreign trade by joining a Company, after which he joined the Czechoslovak Diplomatic Service. Jozef says, “While I was in these professions, even then I used to write. I know six languages – Czech, German, Russian, Hungarian, French and English. This knowledge made my work in the Diplomatic Service quite easy. I have observed the division of Czech Republic and Slovakia from very close quarters, but for me they remain one even today.” After remaining a Member of Parliament, he soon bid adieu to politics. Since 2006 he has been writing a book every year, and 6 of these books have become best-sellers, over 25,000 copies each of which were sold in the market. 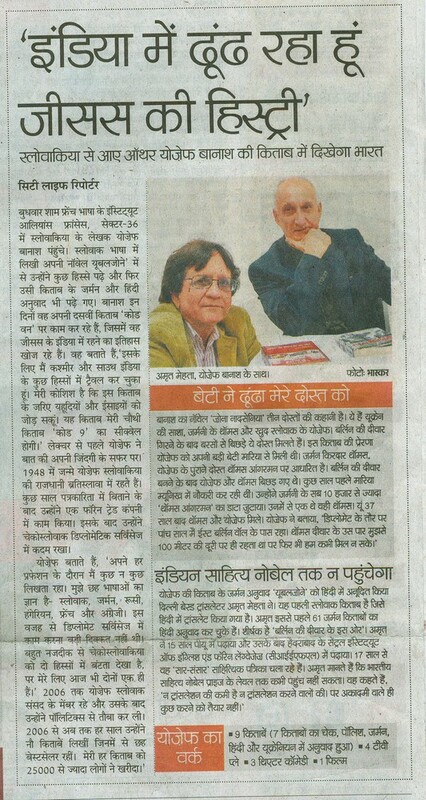 Amar Ujala: Josef Banas’ literature now in Hindi: Dr. Mehta translated a book of the Slovak writer: Josef Banas was not only a Diplomat, he can create magic with his pen, and now his literature can also be read in Hindi. In Slovakia and all over Banas’ literature is best-seller. Banas’ book, which deals with various issues plaguing Europe, has been translated by the eminent translator Dr. Amrit Mehta. 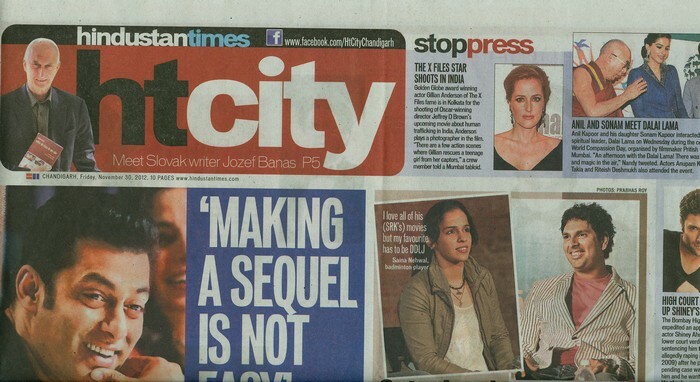 On Wednesday Jozef and Amrit Mehta descended on the city with their book. They shared many things about their book in the Alliance Francais, situated in Sector 36 of the city of Chandigarh. Mehta, who has taught German at Panjab University for 15 years, told the audience that he liked Banas book and after labouring for 1 year he has completed the translation of the book into Hindi. He said that the book has been translated from German. In the book the issues concerning corruption and politicking in Europe have been dealt with in a serious manner. The readers having interest in political science and history will surely like this book. The translated version has been titled “Berlin ki Deewar ke is or”. The Hindi-edition has already been launched in India, and next week it will be launched in Slovakia. In India the book has been priced at Rs.895/-. Jozef elaborated that this is his sixth book. Now he is going to write a new well-researched book on India, for which he had recently travelled to Jammu and Kashmir. Berlin wall raged: On Wednesday the Slovak writer Josef Banas talked about his new book “Berlin ki Deewar ke is or” (Berlin from the other side of the wall) in the Institute of Alliance Francais, situated in Sector 36. In this Slovak book there are 3 friends, the Ukranian Sasha, the German Thomas and Slovak Joseph. The book is based on the Berlin wall, the fall of which makes the reunion of the 3 long-lost friends possible. Banas has been a journalist, diplomat and also a Slovak politician. His book is also a satire on bureaucracy and politics. He has narrated the travails of common man, who is groaning under the weight of corruption. He knows 6 languages. In his life he has seen the division of Czechoslovakia. In 2006 he started his caréer in politics, but could not stick to it for long. He remained a Member of Parliament only for one term, and then never thought about returning to politics. According to him the politics is the main reason that his country is not making any progress. Till now he has written 9 books. These days he is in India looking for the traces of Jesus in India, for which he is touring Kashmir and South India. Hindi Translation: This book of Jozef has been translated by the former Professor of Panjab University Dr. Amrit Mehta. He has translated this book from German into Hindi. Slovak literature has been translated into Hindi for the first time. This is the 62nd book translated by Mehta from German into Hindi.